Civil engineers play a vital role in protecting communities from the impacts of flooding. Learn more about the work civil engineers do in this field, and the skills and knowledge that you'll need to pursue a career in water engineering and management. 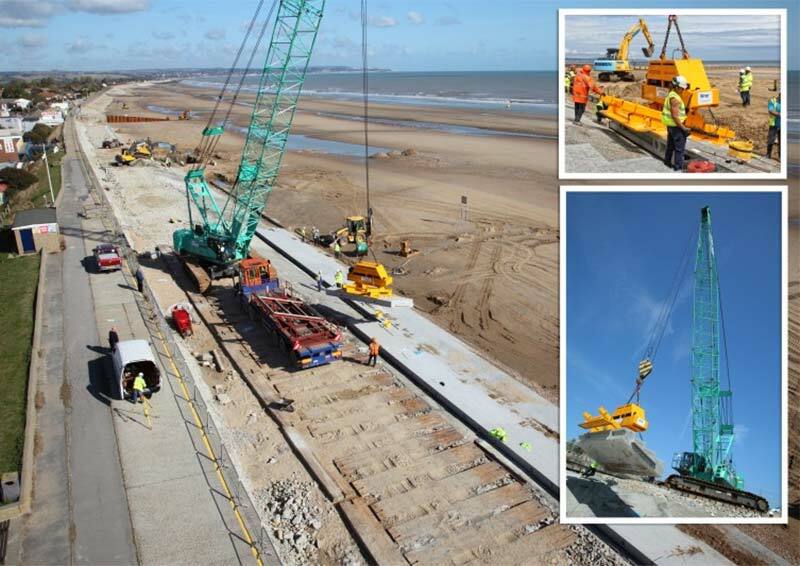 Work underway on sea defences at Dymchurch. Meeting the challenes of coastal flooding will be hugely important as sea levels rise. Civil engineers play a vital role in protecting communities from the impacts of flooding, which can happen at the coast caused by the sea, or inland caused by rivers, waterways or excesses of water in the local drainage network, or from surface water or groundwater. Flood risk management is achieved by extensive research and planning as well as the actual infrastructure that controls water levels. What does a civil engineer in the flood risk management sector do? Civil engineers are involved with detailed analysis methods, which inform projects delivered by national agencies and other authorities with responsibility. Increasingly, local communities are implementing their own measures and often employ specialist flood risk management engineers to assist with projects. “Hard” infrastructure features include dams, embankments, barriers and gates, pumping stations, sea walls and diversion channels. Drainage networks are also important in preventing flooding, especially in towns and cities, by effectively collecting and removing storm water and other surface run-off. At the coast, effective beach management is important in managing flood risk, as a healthy beach can absorb wave energy, reduce wave overtopping and ultimately protect any hard structures present behind the beach (see our guide on coastal and engineering and management for more information). Civil engineers are closely involved in the design, construction and maintenance of all of these structures. “Soft” engineering techniques such as beach nourishment, saltmarsh restoration and managed retreat are also important in understanding and controlling the flow of rivers, other waterways and the sea. Civil engineers predict and model flood risk using their knowledge and expertise in a number of areas – including hydrology and hydraulic flow, sediment transport, wave, tidal and current dynamics, coastal processes and geomorphology. They work with the environment to create natural attenuation and storage in upper zones of catchments to protect downstream communities from flooding. Natural attenuation in upland rural areas using farmland and green spaces alongside climate adaptation solutions is becoming more prevalent in the search for long-term sustainable solutions. In addition to investing to protect homes, businesses and infrastructure, there is also a need to deliver an effective flood incident management service. This involves the monitoring, forecasting and warning for floods and the organisation of emergency response including the deployment of temporary flood defences and organisation of rapid emergency repairs. Civil engineers in the flooding sector must also have a good understanding of legislation, standards and codes of practice, especially when working in more than one country. Within the United Kingdom, each of the four devolved nations has a different approach to flood risk management administration, as in explained in our guide. As a civil engineer in the flood risk management sector, the work you do makes a real difference to people’s lives. Extreme weather may be on the increase due to climate change, bringing increased risk of flood events, especially to homes built on floodplains and towns and cities at the coast. Your work helps to safeguard lives and the property and livelihoods of thousands of people and the benefits will last for many years into the future. As part of your work you will meet a variety of people, including clients, contractors and consultants, all of whom work closely in the planning and delivery of flood risk management projects. You will also engage with other key stakeholders such as local authorities, landowners, regulatory bodies and members of the public. You will work as part of a multi-disciplinary team and will work in partnership with other engineers and specialists to deliver projects. From a policy perspective, the concept of “flood risk management” has now become the preferred underlying approach (rather than “flood defence”) and underpins the strategies of the agencies and authorities tasked with protecting against floods. In many cases, communities are now taking a more adaptive approach to flood risk management, which involves accepting that flooding occasionally occurs and instead reducing the risk at a property level. Examples of such approaches include property level flood protection (e.g. flood door barriers, air brick covers etc) and making properties more resilient to flooding (eg raising electric sockets, concrete floors for easier cleaning etc). Recently there has been a change in the way that flood risk management projects are funded. Rather than obtaining all of the funding for capital schemes directly from the Government, a new approach referred to “partnership funding” has been introduced. The intention is that some funds are secured locally to the project, i.e. from those who will benefit. An advantage of this approach is that the local community has greater influence over, and ownership of, the final solution. However, this approach can also create greater uncertainty for the flood risk engineer, as in the early stages of a project it is difficult to rule out options (e.g. on financial or other grounds). The requirements of the Water Framework Directive (WFD) have created additional considerations. Civil engineers have to consider the interaction between the land and water and their designs and construction must seek to improve the water quality in watercourses in line with EU targets. Another element of current environmental legislation relates to migratory fish and eels – any structure across a waterway must include provision for fish and eel passage. Implementation of sustainable drainage systems (SuDS) has been slow since the recommendations of the Flood and Water Management Act 2010. However, the civil engineer will seek to design solutions that allow for capture and storage of water at its source to reduce the ever-increasing run-off from developments. Flood risk management continues to be a hot topic in the public domain and at a government level so it is expected that the industry will continue to grow. However, with budgetary pressures, the focus is on efficiency and innovation – the challenge being how to achieve the same outcomes but at a lower cost to the public purse. How do I become a civil engineer in the flood risk management sector? Civil engineering is a broad subject and the conventional route is largely through the STEM subjects (Science, Technology, Engineering and Maths). However, as can be seen in the diverse list of sector skills and specialisms, subjects such as economics, geography, computing and law can also be a route to becoming a qualified civil engineer. Flood risk management is now seen as such an important sector of civil engineering that universities run stand-alone degree courses in the subject. Levels of profession within the sector range from apprentice and technician through incorporated and chartered engineer to, at the peak of a career attainment, the status of Fellow of ICE. Many companies offer specific training and initiatives for their employees who are returning to work after a period of absence.Engineers may also choose to go back to university to do a one-year MSc course if they want to transfer to another area of civil engineering. Learning from the 2013/14 floods: Planning for extreme events - This lecture looks at what we can learn from extreme weather events and how we can plan for the future, using the extreme coastal surges seen in winter 2013/2014 as an example. Flood prevention in Manhattan - This case study outlines steps taken in Manhattan to prevent flood damage, including use of AquaFence stuctures. Flood prevention in Fife - Fife Council has invested in over 6,000 new flood protection sacks to help communities that have been affected by flooding. HydroSacks and HydroSnakes are some of the many ways the council is helping families to protect themselves and their properties in the event of an emergency. Cockermouth passive flood defence system - A key section of an Environment Agency (EA) and local authority partnership funded flood defence scheme has been completed in Cockermouth, Cumbria. The scheme encompassed a number of flood protection solutions to protect homes and businesses from flooding.